Cyclone Mekunu will be "extremely severe" when it crashes into the Arabian Peninsula this weekend after earlier thrashing the Yemeni island of Socotra, meteorologists warned Friday. 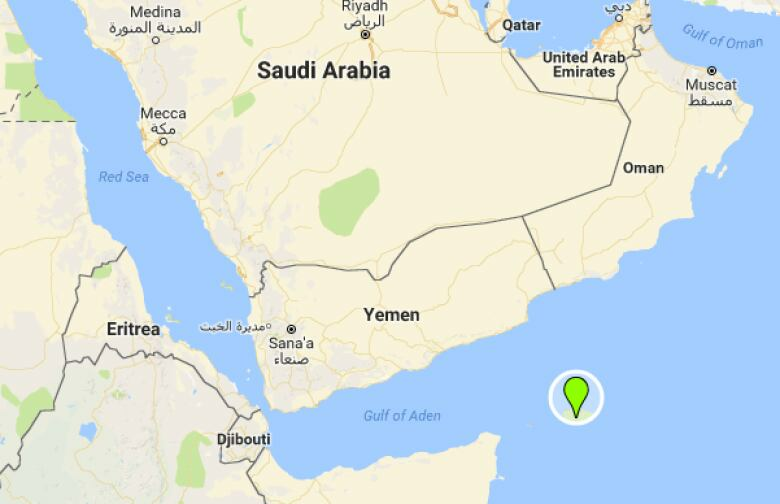 At least 17 people were missing from Socotra. Cyclone Mekunu will be "extremely severe" when it crashes into the Arabian Peninsula this weekend after earlier thrashing the Yemeni island of Socotra, meteorologists warned Friday as the eye of the storm headed toward the coast of Oman. Yemeni officials said preliminary figures show at least 40 people — including Yemeni, Indian and Sudanese nationals — were missing on Socotra, where flash floods washed away thousands of animals and cut electricity and communication lines. The cyclone is expected to make landfall early Saturday near Salalah, Oman's third-largest city and home to some 200,000 people near the sultanate's border with war-ravaged Yemen. 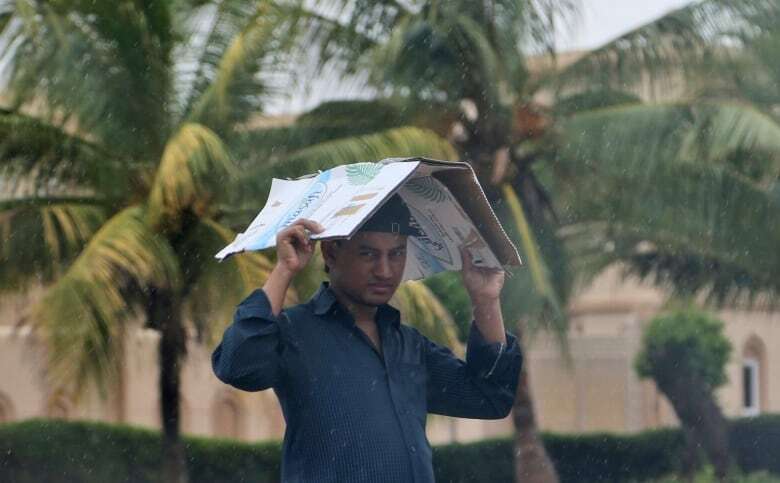 Conditions quickly deteriorated in Salalah after sunrise Friday, with winds and rain beginning to pick up. Strong waves smashed into empty tourist beaches. Many holidaymakers fled the storm Thursday night before Salalah International Airport closed. The Port of Salalah — a key gateway for the country — also closed, its cranes secured against the pounding rain. Streets quickly emptied across the city. Standing water covered some roads and caused at least one car to hydroplane and flip over. A sizable police presence fanned out, many in Royal Oman Police SUVs with chicken wire over the windows. As torrential rains poured down, local authorities opened up schools to shelter those whose homes are at risk. 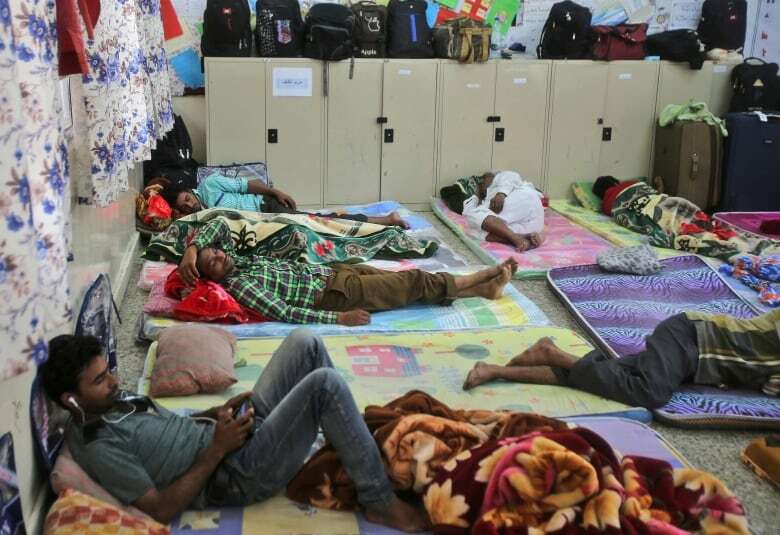 About 600 people, mostly labourers, huddled at the West Salalah School, some sleeping on mattresses on the floors of classrooms, where math and English lesson posters hung on the walls. Shahid Kazmi, a worker from Pakistan's Kashmir region, told The Associated Press that police had moved him and others to the school. He acknowledged being a bit scared of the storm but said: "Inshallah, we are safe here." 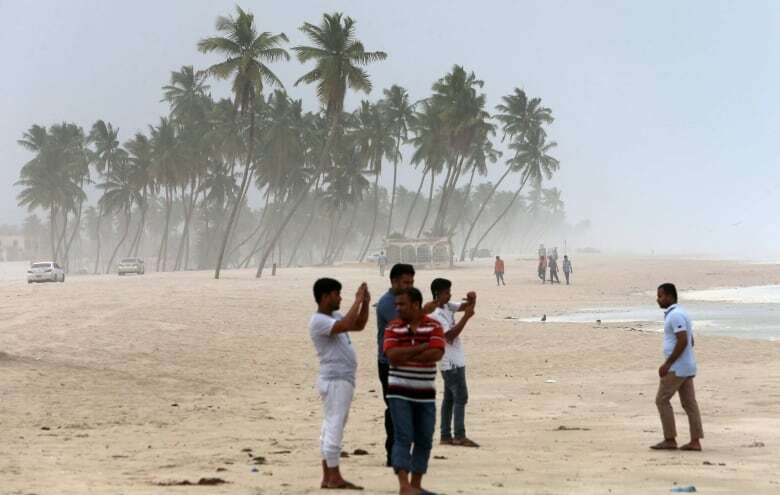 India's Meteorological Department said the storm in the Arabian Sea was packing maximum sustained winds of 160-170 kilometres per hour, with gusts of up to 180 km/h. On Socotra, flash floods engulfed streets, washed away thousands of animals, and cut electricity and communication lines, they said. Some humanitarian aid from Saudi Arabia and the United Arab Emirates arrived on the island just hours after the cyclone receded. The officials said heavy rains are now pummelling Yemen's easternmost province of al-Mahra along the border with Oman. Earlier, when 17 people were reported missing, the island's Gov. Ramzy Mahrous said one ship sank and two others ran aground in the storm, which sent torrents of rain pouring through homes and streets, leaving residents soaking wet and trying to wade to safety. "We consider them dead," the governor said of the missing. Yemen's self-exiled President Abed Rabbo Mansour Hadi in a statement ordered troops under his command on the island to help citizens, deliver supplies and reopen roads. The island, listed by UNESCO as a World Heritage Site, has been the focus of a dispute between the United Arab Emirates and Yemen's internationally recognized government amid that country's war after Shiite rebels, known as Houthis, seized the Yemeni capital, Sanaa. Saudi troops recently deployed on Socotra as a confidence-building measure over complaints by Yemen's government that the UAE deployed troops there without its permission. 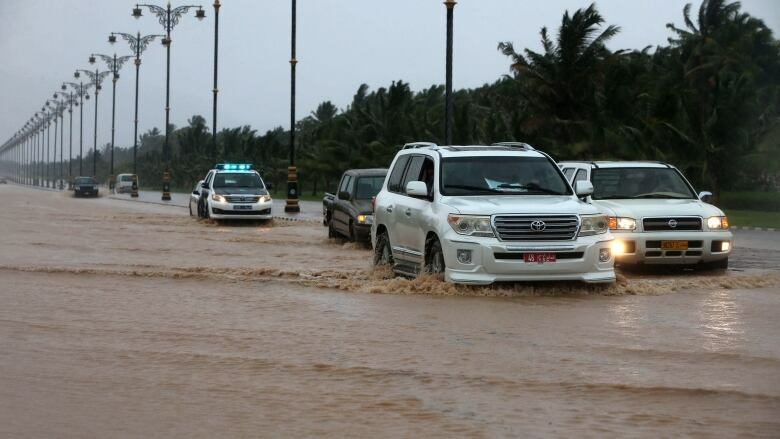 Salalah, the hometown of Oman's longtime ruler, Sultan Qaboos bin Said, already began sandbagging low-lying doors Thursday and warning residents not to go into valleys for fear of flash floods. Oman earlier also sent rescue helicopters to remote villages in its Dhofar governorate to evacuate those who could be impacted by flooding or mudslides. It also evacuated the critically ill from Sultan Qaboos Hospital in Salalah, flying them north to Muscat, the country's capital. Seasonal rains are nothing unusual for southern Oman this time of year. While the rest of the Arabian Peninsula bakes in areas where temperatures near 50 C, those in this sleepy port city enjoy rainy weather that sees fog and cool air wrap around its lush mountainsides. Temperatures drop down around 25 C during its annual monsoon festival. Powerful cyclones, however, are rare. Over a roughly 100-year period ending in 1996, only 17 recorded cyclones struck Oman. In 2007, Cyclone Gonu tore through the sultanate and later even reached Iran, causing $4 billion US in damage in Oman alone and killing over 70 people across the Mideast. The last hurricane-strength storm to strike within 160 kilometres of Salalah came in May 1959, according to the U.S. National Oceanic and Atmospheric Administration's archives. However, that cyclone was categorized as a Category 1 hurricane, meaning it only had winds of up to 152 km/h. A cyclone is the same as a hurricane or a typhoon; their names only change because of their location. Hurricanes are spawned east of the international date line. Typhoons develop west of the line and are known as cyclones in the Indian Ocean and Australia. Mekunu, which means "mullet" in Dhivehi, the language spoken in the Maldives, is on track to potentially be the same strength as a Category 2 hurricane at landfall. It also comes just days after Cyclone Sagar struck Somalia.